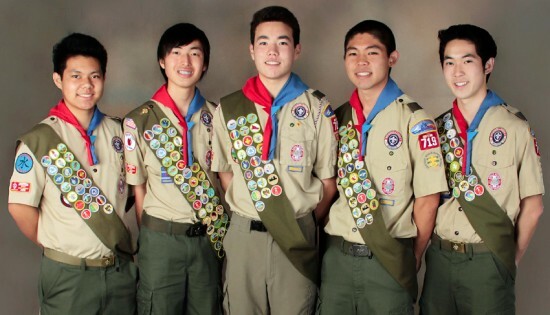 Troop 719 Eagle Scouts (from left) Michael Kaji, Cody “Hawk” Kuwata, Kyle Wada, Austin Kuniyoshi and Ryan Lee. TORRANCE — Boy Scout Troop 719, sponsored by Faith United Methodist Church, celebrated and honored five young men – Michael Kaji, Cody “Hawk” Kuwata, Kyle Wada, Austin Kuniyoshi and Ryan Lee — for their achievement of the highest scouting rank as Eagle Scouts at the Ken Nakaoka Memorial Community Center in Gardena on March 9. Michael Kaji was born on July 28, 1995 to Arnold and Karen Kaji at Little Company of Mary Hospital. He is an only child and lives with his family in Torrance. Currently a senior at South Torrance High School, he will attend Cal State Dominguez Hills in the fall. In 2004, Michael began his scouting career as a Webelo Scout in Cub Scout Pack 862. He obtained his Arrow of Light award before bridging over to Boy Scout Troop 719 in 2006. He has hiked and backpacked in such places as San Jacinto, San Gorgonio, Yosemite, Mammoth and Tooth of Time in New Mexico. His favorite hike was the 2009 Maui long-term and he looks forward to hiking on the Big Island this summer. In the troop, Michael has held such positions as librarian, historian, quartermaster and assistant patrol leader. In 2011, he became a patrol leader for the Sharkas and received the “Awesome Patrol” award during the fourth quarter. He was proud to receive the 2012 “Philmont Hiker of the Year” award and currently holds the position of assistant senior patrol leader. For his Eagle project, Michael chose to help the L.A. County Department of Children and Family Services. On Jan. 7, 2012, with the help of his project advisor, Jerry Takao, he led a group of more than 100 troop members, alumni, family and friends to build a custom shed with metal shelving and plastic containers for organized storage of donated clothing. Rosa Tang from the DCFS expressed her praise and appreciation for the successful completion of the shed. Doing his Eagle project taught him the importance of proper planning, research, taking good notes, “measure twice…” and having good communication skills. Obtaining the rank of Eagle Scout is Michael’s greatest achievement thus far. He hopes to take all that he’s learned about scout skills, leadership and community service and apply them to his future endeavors. He has gained many wonderful memories and life-long friendships. He would like to thank the past and current Troop 719 scouts, hiking adults, Scoutmaster Corps, Mothers Club, his friends and relatives for their guidance and support during his scouting career. He is most grateful to his parents and grandparents for all their love and encouragement. The characteristics associated with an Eagle Scout are honor, prestige and pride. Hiking, peaking, and learning all symbolize the aspects of Troop 719. The journey to Eagle is a difficult challenge taken on by a young Boy Scout. Although there are many obstacles to cross, this young scout takes on new experiences and ultimately finds his wings to become a man. Ryan Ben Lee took on this challenge, tremendously impacting his life. He was born at Kaiser Harbor City Hospital on Oct. 19, 1995 to Steve and Noriko Lee. He is very close to his older brother, Scott, and considers him his best friend. Ryan attended Montemalaga Elementary and Palos Verdes Intermediate, is currently a junior at Palos Verdes Peninsula High, and hopes to attend a four-year UC school. In school, he is active on the basketball team, and participates in National Honors Society, Science National Honor Society, Heroes Club, and Kiwin’s Service Club. Ryan has played basketball since kindergarten for various teams and clubs such as FOR, Triple-S, PVBA and ACES, and is currently with the FOR Hangtime. In 2010, he had the honor and privilege of traveling to Japan with Yonsei 17, including three teammates, Eric Komatsu, Cameron Tong and Davis Higashi, along with 20 other boys and girls. He learned a lot about Japanese heritage through his homestay, where he became good friends with Retsu Oba. Ryan joined Troop 719 in December 2006, following in the footsteps of his cousins, Matthew and Michael Fujiura, who are both 719 Eagle Scouts. His former patrol leaders include Danny Inouye, Alan Nakagawa, Greg Mizukami, Jordin Hino, and Hawk Kuwata. In 2012, his patrol was the Call of Boy Scouts patrol. In his years of scouting, he served as chaplain’s aide, troop historian, den chief, assistant patrol leader, and patrol leader. His first six years of scouting led up to one defining day — his Eagle Scout project at the Gardena Valley Japanese Cultural Institute, which holds classes and events for the Japanese American community and provides organizations such as FOR and Sansei Baseball a place to store equipment. With the help of over 100 scouts, friends and family, Ryan carried out his project with great success. New canopy/pole racks and chair racks were constructed, the southwest part of the garage was cleaned and reorganized, and unnecessary equipment was disposed of. Through the hard work from many, it was clear that there was significant difference made for a worthy organization. Troop 719 has provided many valuable life experiences and lessons that have helped him to become a more mature, responsible and well-prepared adult. He is grateful to all of those who helped him on his path to Eagle and made his scouting career a more than memorable experience, from the Mothers Club and Scoutmaster Corps, to fellow scouts and all of the parents of the troop. His family has made the greatest impact on not only his scouting career, but on his life as well. Born in Garfield Medical Center on Feb. 20, 1995, Austin Kuniyoshi is now a teenager and Eagle Scout. He is the first born to his parents Kurt and Harvie Kuniyoshi and brother to Aydin Kuniyoshi. He began preschool at age 3 and continued his early education with pre-kindergarten at Oneonta Montessori School until the second grade. At age 7, he moved from Rosemead to Torrance. For grades 2 through 8, he attended Lincoln Elementary School and Casimir Middle School. He now attends the California Academy of Mathematics and Science as a high school senior. Austin has been involved in many extracurricular activities such as acting. When he was in elementary school, he actively auditioned for commercials, television shows and movies. Selected for a McDonald’s commercial, he had the opportunity to meet Kobe Bryant in person. Austin has also participated in sports. While in elementary school, he learned tae kwon do and eventually became a red belt, learning perseverance and self-discipline. In middle school, he played baseball with the North Torrance Little League on the A’s and the Mets. He also played with the Sansei Baseball League as catcher, pitcher, and third baseman. Starting in eighth grade, he joined the F.O.R. basketball team, the Heat. When high school came around, he played JV tennis in his freshman and sophomore years. He continues to play tennis with the varsity team. His scouting career began when he was 12, later than most. Hearing about scouting from one of his friends, Austin joined Troop 719 in 2007. Through Boy Scouts, he has been presented with many unique opportunities that include hiking, outdoor camping, and rock climbing. He has been fortunate enough to attend each troop long-term hike since joining the troop, including the Mammoth Mountains, Mount Haleakala, and Mount Whitney. From these hikes and scouting experiences he has learned how to be a wise leader as well as an obedient follower. His responsibilities have taught him a lot about being an ethical and moral decision-maker. The scouting positions he has held include librarian, assistant patrol leader, patrol leader, and assistant senior patrol leader. For his Eagle project, Austin decided to give back to his high school, CAMS, by assisting the Drama Department. With the help of many scouts, adults, and friends, he successfully completed his project. When finished, the department was provided with a new storage shed, a set of weatherproofed stage platforms, a trio of stage boxes, a cart transport, and a reorganized storage room. The project could not have been completed without tremendous help from his Eagle advisor, Jim Matsushita; construction advisor, John Shimane; Boy Scout troop and alumni; CAMS faculty; and friends. After years of eye-opening and breathtaking experiences, Austin has learned significantly about himself and who he wants to be. He hopes to attend Stanford or UCLA and major in psychobiology or biology. After college, he dreams of going to medical school to become a doctor. He will never forget the lessons and memories that scouting has provided him. Cody “Hawk” Kuwata was born Feb. 14, 1996 in Woodland Hills to Miles and Rouxann Kuwata. Shortly after birth, his Grandma Betty gave him the nickname Hawk. He has two younger brothers, Jake (14) and Grant (13), who are scouts in Troop 719. The family lives in Agoura Hills. Hawk attended Oak Hills Elementary School and Medea Creek Middle School and is currently a junior at Oak Park High School. He likes to spend time with his family and friends, ski and play video games. He is a student of mixed martial arts and is working to achieve the rank of black belt. He is involved in many youth organizations, including Youth CAN, Katarou Histories and Rising Stars, and is a member of the San Fernando Young Buddhist Association. He also played basketball for nine years with the SFVJACC with his team, the Timberwolves. He has many great experiences and memories from playing basketball and even met his best friend, Brandon Isa. He has four South Bay cousins who are Eagle Scouts from Troop 719, Scott and Robb Kaneko and Randy and Ryan Shiozaki. After attending the Troop 719 Eagle Court of Honor for Robb and Randy, Hawk’s parents wanted him to join Boy Scouts too. They searched for a troop closer to home but in the end they wanted Hawk to learn more about his Japanese culture and be part of the proud tradition of Troop 719. Luckily, in his first year Hawk was in the Bruin Patrol, where his cousin Ryan was patrol leader. It was tough, but Ryan, the other scouts and Scoutmaster Corps helped Hawk get through his first year of scouting. Since then, Hawk has gone on many hikes and long-terms, including Haleakala in Maui and Philmont Scout Ranch. Hawk led his Black Hawk Patrol on many hikes and even peaked Mount Whitney on a 10-day, more than 50-mile grueling long-term. The Black Hawk Patrol received the “Awesome Patrol” of the quarter award. Hawk received the “Scout of the Quarter” award and even won third place at International Field Day in the Knife and Ax event. Hawk has held the positions of chaplain’s aide, historian and, currently, instructor. He has attended five summer camps, serving as assistant senior patrol leader and senior patrol leader twice. He has 43 Merit Badges and plans to obtain his Bronze, Gold and Silver Palms. Hawk chose the SFVJACC to complete his Eagle service project. SFJACC President Karl Nobuyuki is an Eagle Scout and had the perfect idea for the project. The first part was to widen an existing pathway by removing old baseball bleachers, allowing passage of a golf cart to transport seniors from the Nikkei Village to the community center if they are too frail to walk the distance. The second part included building storage tables for use by the San Fernando Athletics department and Japanese School. Thanks to Eagle project advisor David Wada and construction advisors Jerry Takao, Nathan Tanaka and Jerry Tondo, the project was a huge success. Scouting has taught Hawk many lessons to help guide him through life. He has learned how to be a leader and lead by example, the importance of helping the community and those who cannot help themselves, and to work hard and never give up. He would like to thank Troop 719 and all his friends and family who have helped support and encourage him. Kyle Wada was born on Aug, 21, 1995, at Little Company of Mary Hospital in Torrance. He is one of two sons, with his younger brother Evan, to David and Helen Wada. Kyle enjoys listening to music, playing golf and guitar, and hanging out with friends. He attended Arlington Elementary School and Casmir Middle School. He played the flute in the Casmir school band. Currently a senior at North Torrance High School, Kyle continues to strive for good grades, taking on many AP classes in his busy schedule. He also played on the North High JV golf team for his freshman, sophomore, and junior years. Besides school, Kyle played for the Cougars in the Sansei Baseball League, as well as learning karate at the Japanese Cultural Institute. He is also actively involved at Faith United Methodist Church, doing volunteer work. Every summer since his freshman year, he has been going to the Southern states to help with natural disaster relief. In addition, he regularly travels to Tijuana with the church to build homes for the less fortunate. Kyle began his scouting career at age 6, when he officially joined Cub Scout Pack 862 of Faith UMC. He achieved the Arrow of Light award, then at age 10 he bridged to Boy Scout Troop 719 in Torrance. For the past seven years, he has gained valuable knowledge and experience that will be with him for the rest of his life. Over the years, he has held positions such as scribe, librarian, assistant patrol leader, patrol leader, and is currently serving as senior patrol leader. In 2011, as the patrol leader of the Saltwada Inouysters Patrol, Kyle had the honor of leading his patrol through many hikes and activities. This culminated in conquering Mt. Whitney, the tallest mountain in the contiguous U.S., during the troop’s long-term hike that summer. Because of his leadership and hiking spirit, Kyle was nominated for the coveted Hiker of the Year award. For his Eagle project, Kyle chose the Epworth Apartment Project in South Central L.A. because he wanted to do a unique project that reflected his environmental character. On June 23, 2012, with advisor John Shimane and a group of over 50 friends, family, troop members and alumni, Kyle landscaped the front of the garden, assembled a tool shed, and built a compost bin for the local community. Overall, Kyle is very proud of the accomplishments of his project. Being a Boy Scout, and now an Eagle Scout, has been a major part of Kyle’s life and given him the valuable skills necessary for his future. Leadership, teamwork, to never give up, and to be a more responsible and respectable young man are the attributes that Troop 719 has taught him. Attaining the Eagle Scout rank has been the biggest accomplishment in his life so far and he is thankful for those that helped him accomplish this goal. He would like to thank his past patrol leaders, scoutmasters, the fathers, the Mothers Club, the alumni, friends, Faith UMC, the Eagle Board of Review panel, teachers, and most of all his family for all their love and support.